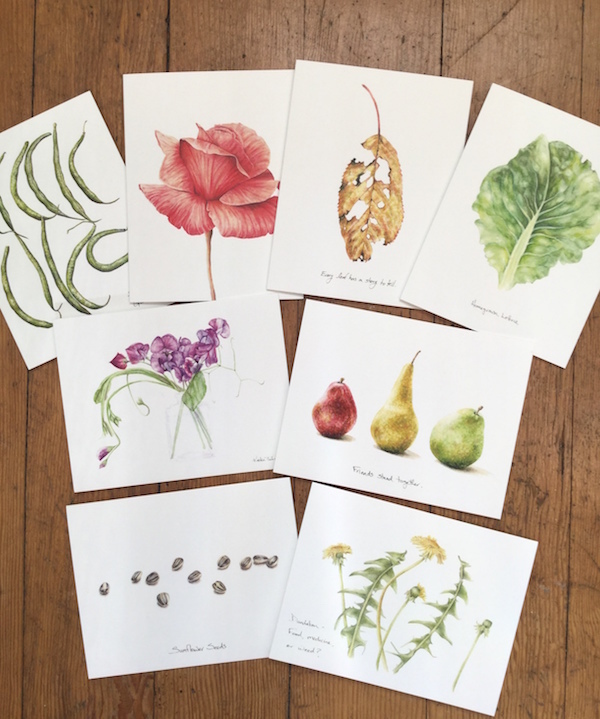 I've finally finished my greeting cards and I'm really pleased with how they've turned out. It's been a fun project to see my artwork take on a new dimension. 8 of my paintings of homegrown flowers, food and seeds are printed on lovely 110lb linen textured card stock and come with matching linen envelopes. 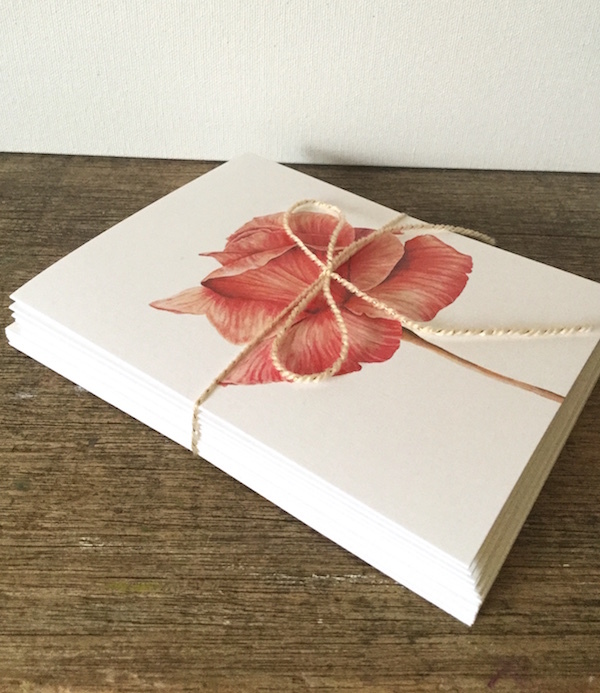 They can be used for a variety of occasions and are blank inside for your own personal message. You can also see more of what I'm up to on my Instagram and Facebook accounts. 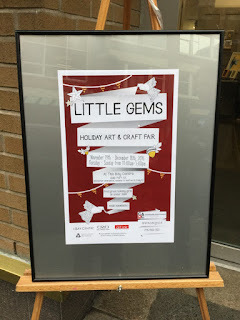 I'm part of a show going on downtown right now and wanted to let you know about it! 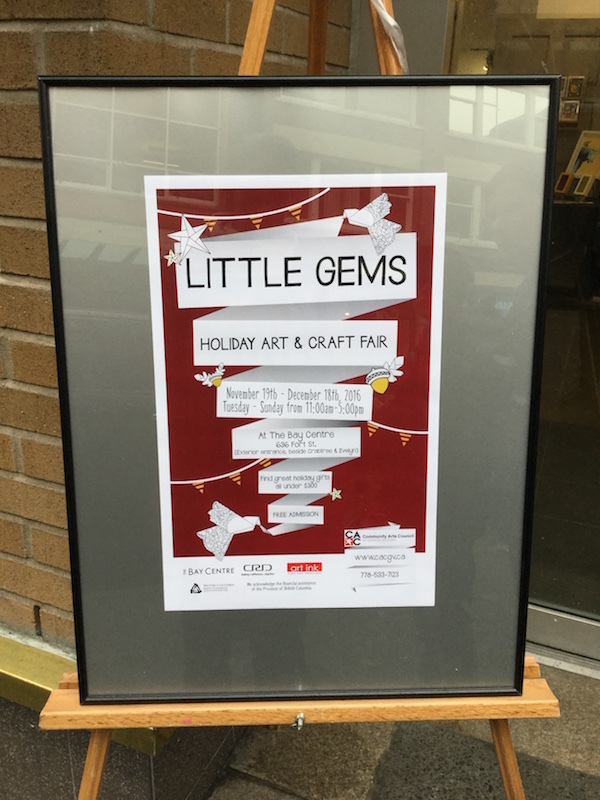 It's put on by the Community Arts Council of Greater Victoria and the show is called "Little Gems, holiday art and craft fair". 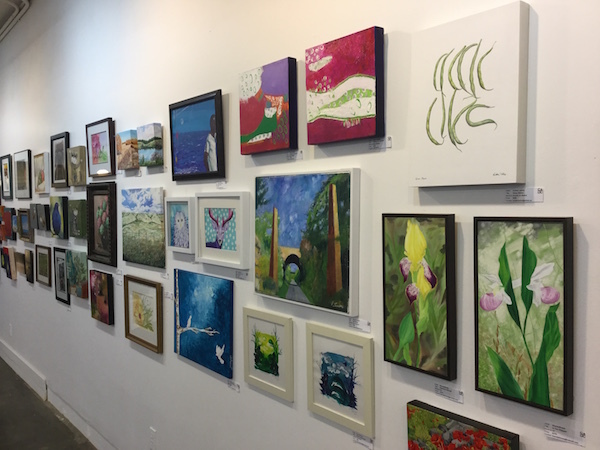 It's featuring small pieces made by many artists from around Victoria and I have two paintings in the show - "Green beans" and "Blue Pansy". 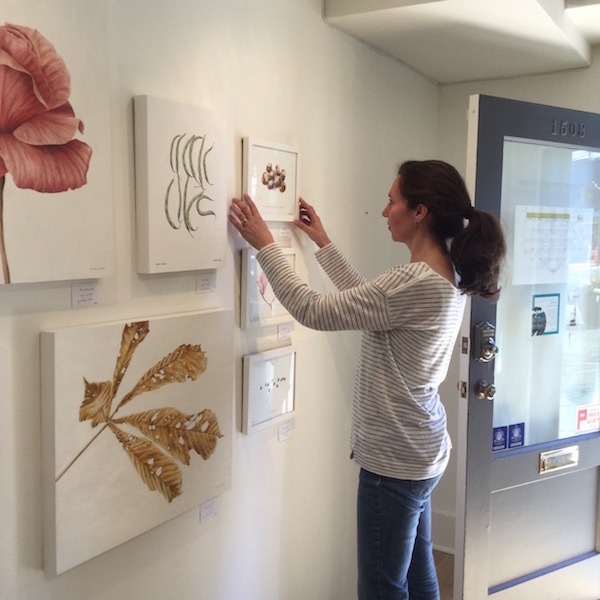 If you're in Victoria and shopping downtown, pop in and take a look at some art. There's such a variety of styles it makes for an interesting show. 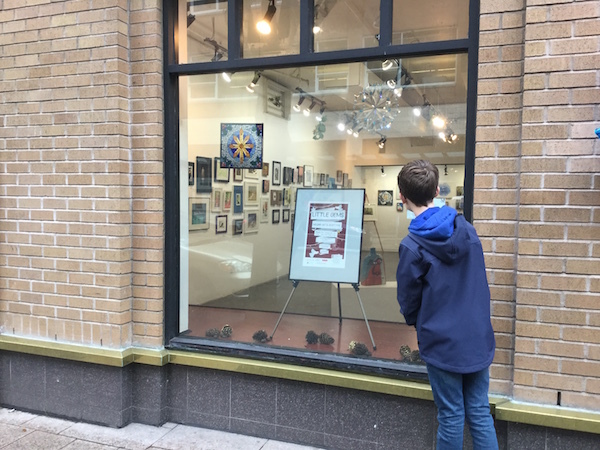 The CAC is located at 636 Fort Street, close to the Bay Centre and the show runs from now until December 18th (Tuesday-Sunday, 11 to 5). Hello! 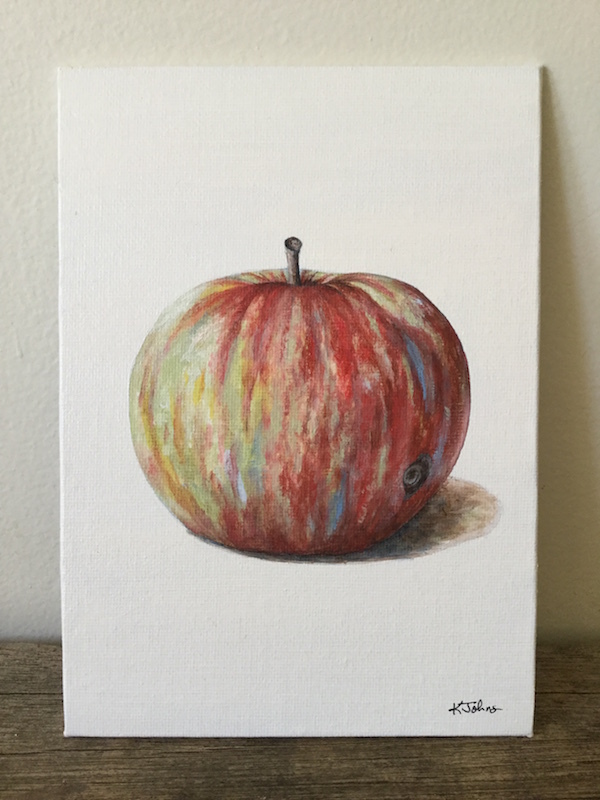 I've been working on some new small paintings and wanted to share. 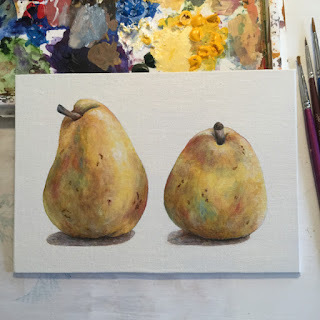 As the season changes, so do my subjects and my colour palette and these little gems have happened. Each of these "portraits" has a story to it which made me want to paint them. The apple, for instance, is a heritage variety which grows in our backyard and it looked so grand, proud really, and has such character that it deserved attention. But these apples also get plagued with earwigs, and so this apple is flawed too, with an earwig hole on the side. 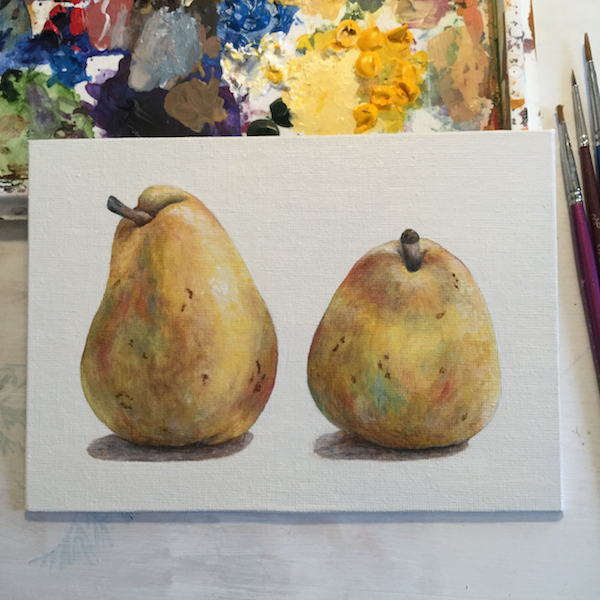 The pears came from a friend's backyard, also from a very old tree, and when these two pears were sitting together on my kitchen counter they looked like a funny old couple...perhaps they're shy, or just a little bored of each other, I'm not sure, but I wanted to paint them. And the black-eyed Susan was glowing in my front yard last week. It was perfect in the soft morning sunshine, but I knew it wouldn't last long, so I wanted to capture it before the petals fell and it was gone until next year. All of these, and a few more, are in my shop if you want to take a closer look: shop.kristenjohns.com. They're only 5x7 inches and painted on canvas board so they can easily be popped into a frame. 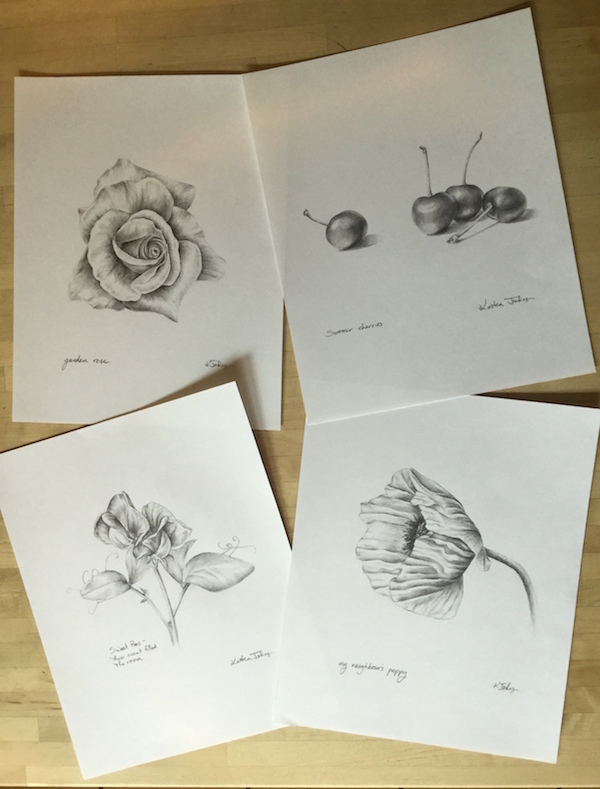 I picked up my pencils a few weeks ago and it seems that I can't put them down! I've been loving doing these drawings. 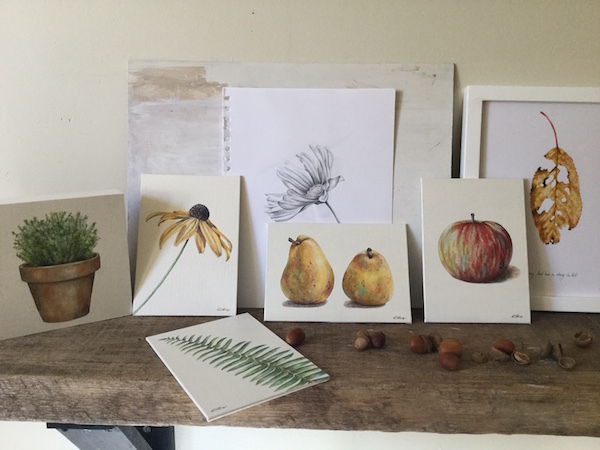 The simplicity of pencil on paper is heavenly and I can focus on all the many tones of grey and feel quite relaxed. Perhaps it's the summer weather that also makes me want to keep things light and simple. 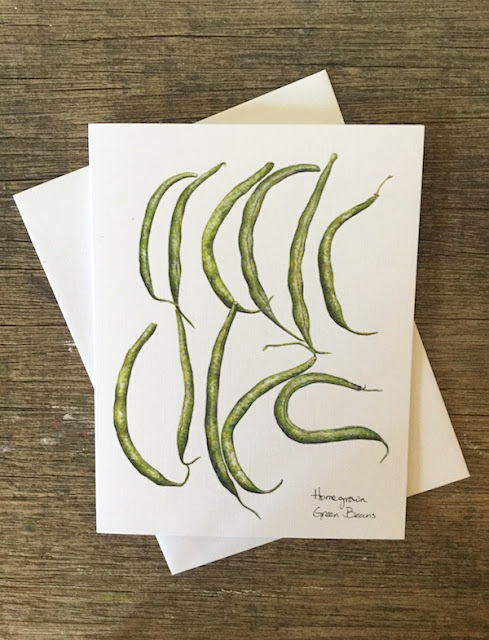 I hope you're enjoying your summer gardens! Dandelion - food, medicine, or weed? 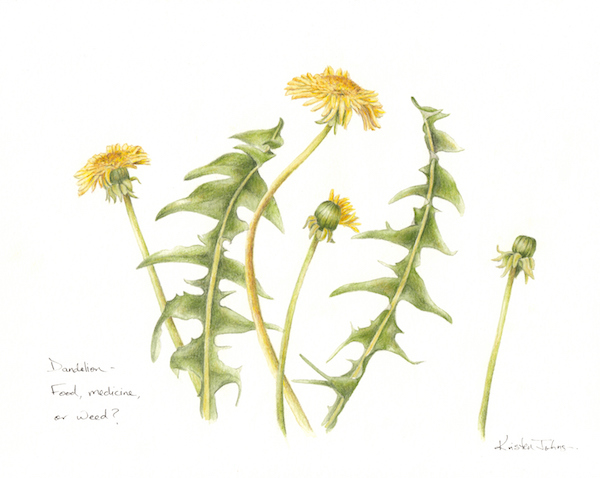 I've been rethinking the humble dandelion... do you consider it food, medicine, or weed? Or is it actually a really beautiful plant that I have way too many of? While I try and figure out wether to pull these little plants out by the roots, or to harvest their greens, I thought I may as well start with a drawing of them. This is 8x10 inches, and was made with watercolour paints and coloured pencils on paper. It is available in my shop! I've just finished this painting of a blue pansy and wanted to share it with you all! It's made with acrylic paint and it's on a wood cradled panel, 16x16 inches. Oh pansies... you know I love-hate them, but they intrigue me. I love them because of their beautiful colours and their soft fluttery petals. 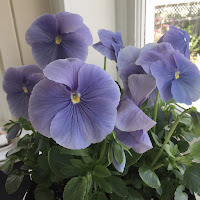 I hate them because, well, the petals are so delicate that they don't hold up in the garden - they get crushed, eaten, and bashed into the soil and always look disappointing. 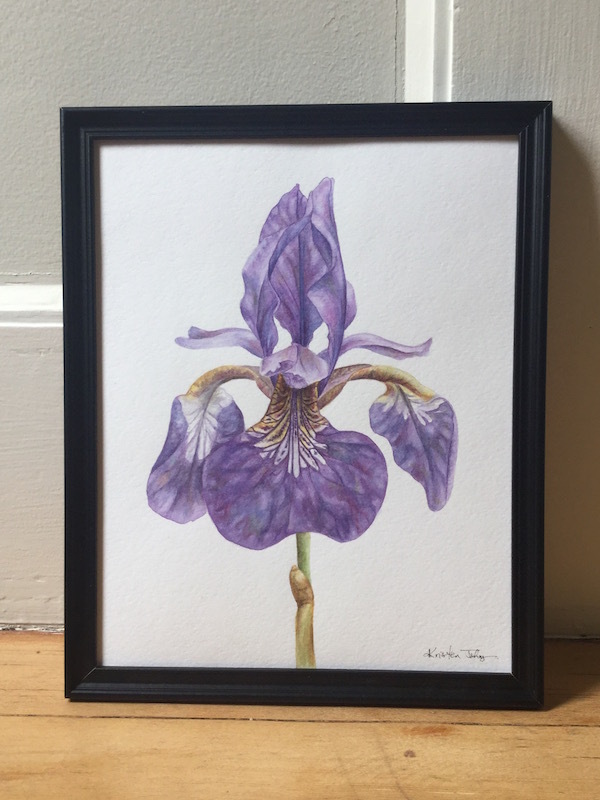 So for this painting, my challenge was to see if I could capture the best of the pansy - could I make it bold and delicate, strong yet vulnerable? I hope you like how it turned out! 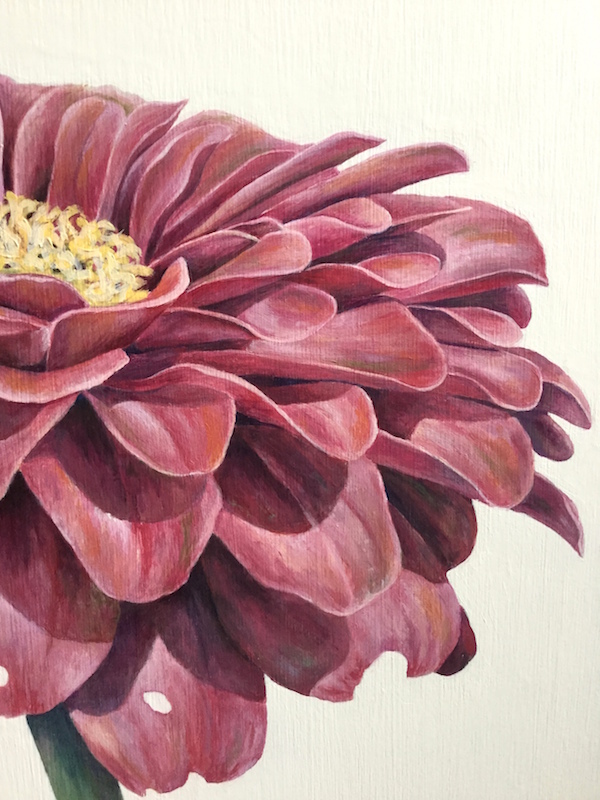 To make this painting, I watered down my acrylic paints to make them act like watercolours and did many layers of blues and purples, trying not to loose the lightness of the delicate petals. It was a beautiful mess of blues to wade through for a couple of weeks. 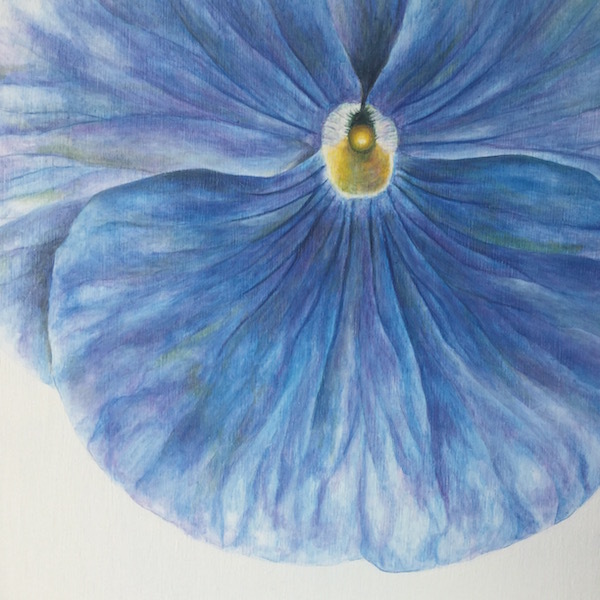 I've been happily lost in many washes of blues and purples lately, painting a very large pansy. I kind of love-hate pansies... they are such a welcome hit of colour in spring and their delicate petals are lovely when they're sitting at the garden centre hoping you'll pick them up and take them home. But then, once they're planted in the dirt, those delicate petals get crushed down by the lightest spring rain shower and continue to get eaten by slugs. Yes, I love them, and loathe them! I thought it would be wonderful to paint one and celebrate all that lovely watery colour and see what would happen if I painted one very large. 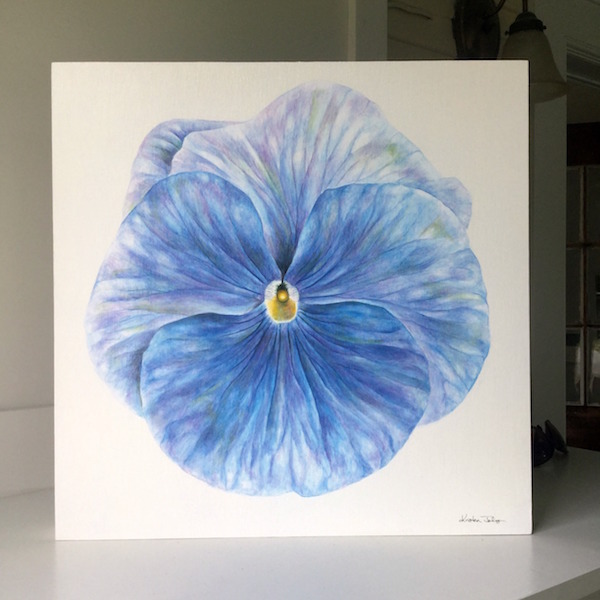 I chose a blue pansy, which I was quite taken by, but then grows more purple as it matures, and I decided to paint on a 16x16 inch square panel. Here is a peek at the painting in progress, as I'm building up the layers of colour. 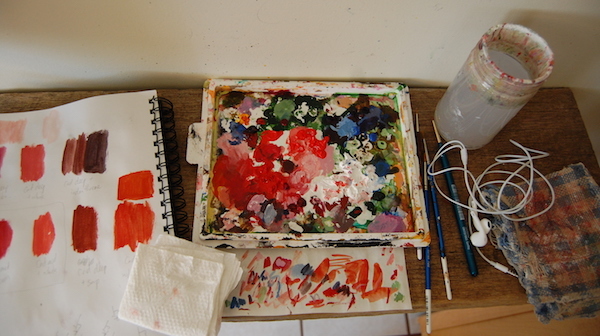 Even though I have a place to paint, the living room floor was the only spot that seemed right that day. It's like I needed to lean over the painting to be fully immersed in it, rather than staring AT it on an easel. The painting is almost finished now... just fine tuning some details. 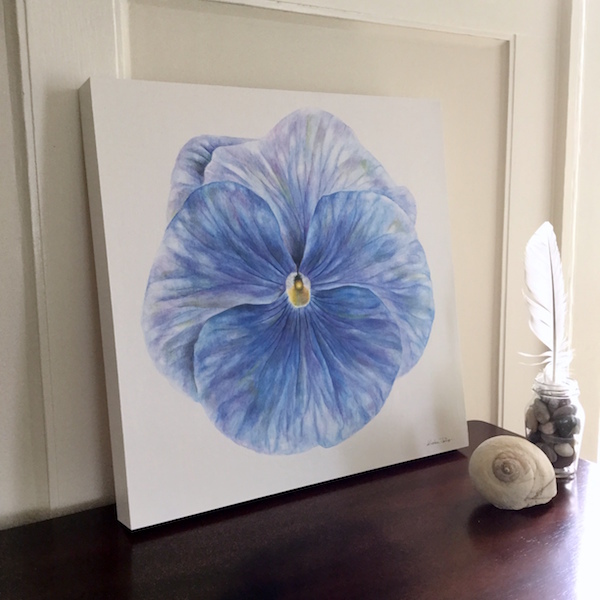 I'll post the completed blue pansy very soon! I've had a lot of fun this past week getting ready for an art show. 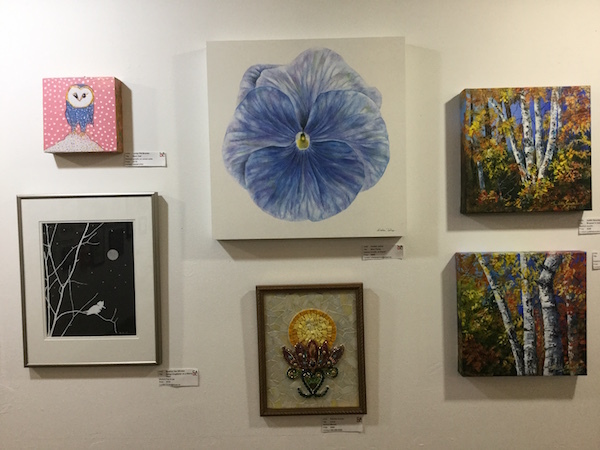 I was asked to hang some of my paintings in the lovely art studio, Poppet Creative, run by the very talented Andrea Soos. She gave me a wall to fill, and I did! 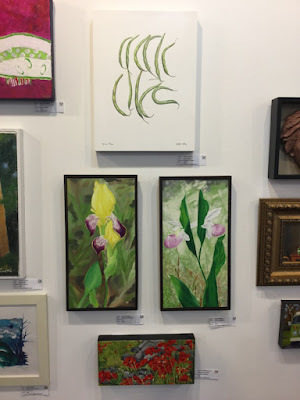 It was great to see my paintings in a new way, not to mention, my garden! That's what struck me as I was laying them all out - all of those plants mean something to me and I've taken care of them over the years, and now they're living on in a totally different way. 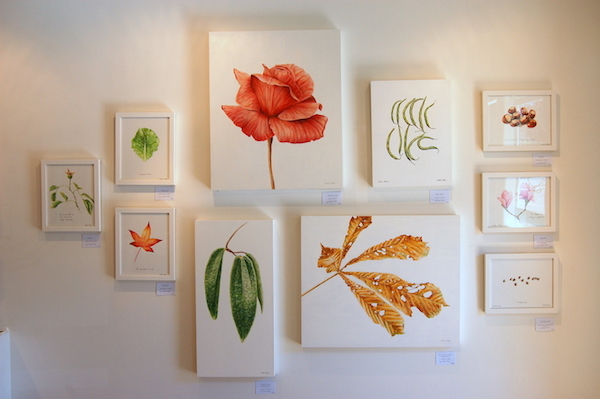 Seeing my paintings framed and labelled and looking their best was also a real thrill. I was really pleased with how it all came together and I was so happy to have this great opportunity. Poppet Creative is a studio that runs art classes for kids and adults so there will be a lot of creative people coming and going. 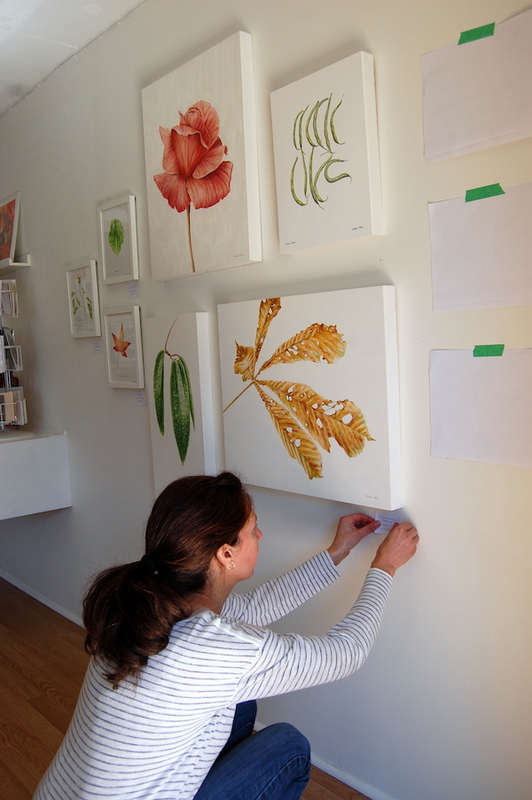 If you live in Victoria and want to stop by to take a peek, the studio has "open studio" times on Mondays and Tuesdays from 9:30-11:30 which is a good time to come in and say hello. ...into a bit more social media! You can now check me out on Instagram and Facebook and see more of what I'm up to on a daily basis. It's been really fun exploring some new ways to show my work and tell my story. 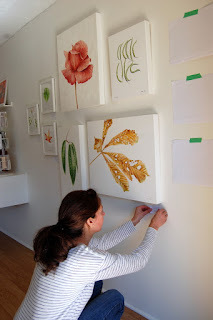 I'm posting lots of plants, paintings and inspirations too. Hope to see you there! 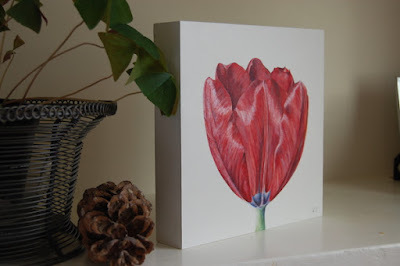 This week I've been swimming in all shades of red as I worked through this painting of a tulip. 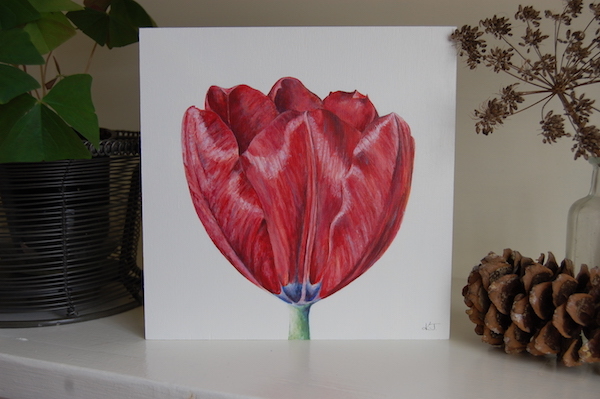 Tulips have such intense colour that we all love and I really wanted this painting to be vibrant, rich and bold. 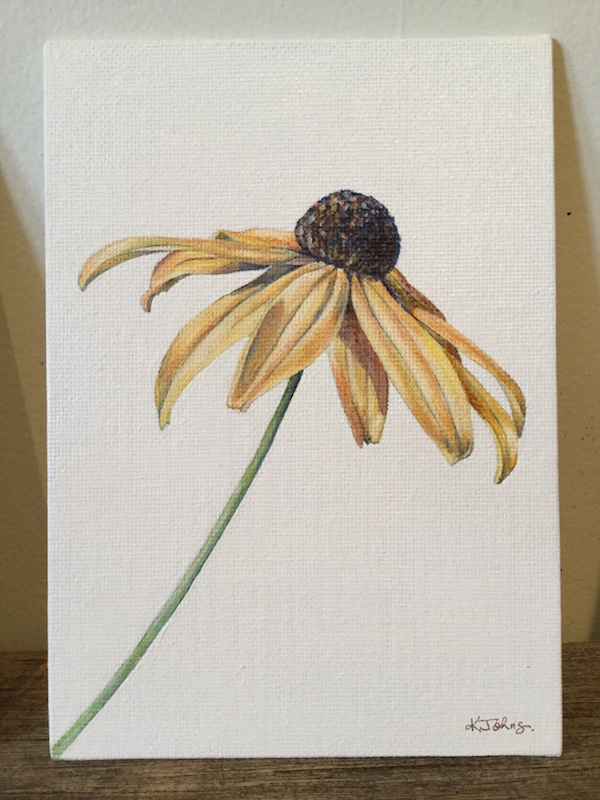 It's fairly small (8 x 8 inches) but it sure brightens things up wherever it's sitting. A lovely punch of colour sure is welcome in the house as we are finding our way out of winter. I think that's the reason why I was drawn to it this week - I need colour and I need Spring! One last shot for you... in order to make a painting I have to go through some mess and so here's a little glimpse of my painting table this morning with the leftovers of this tulip - headphones and all. I've just finished my latest painting and wanted to share. 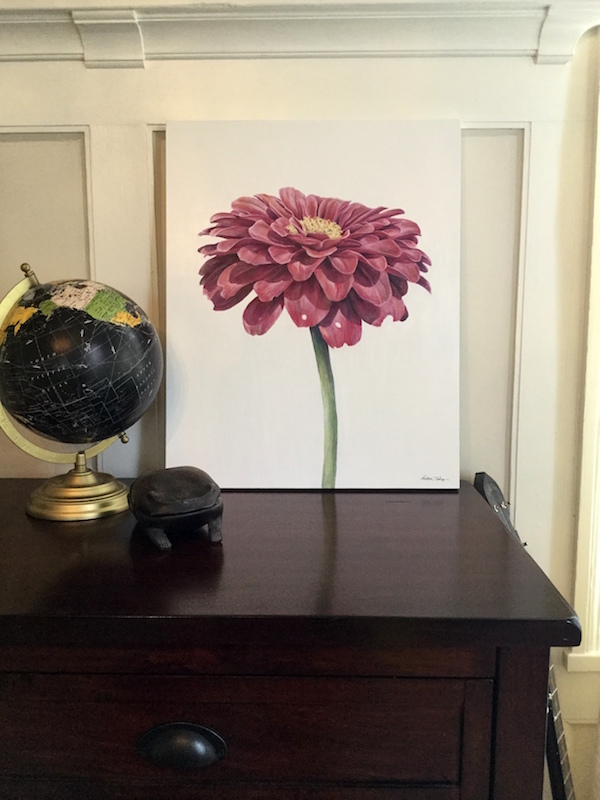 I've called this one "Quietly Thriving". Here are my clematis leaves, with their many layers of green. I worked hard on all those veins, since that was the main focus of the whole painting. I was hoping to create a balance between the simple, quiet form of the leaves and the wildness of all the vein lines running through them. And I did love adding those flecks of pink and blue to liven it up. Boy, I just love plants! 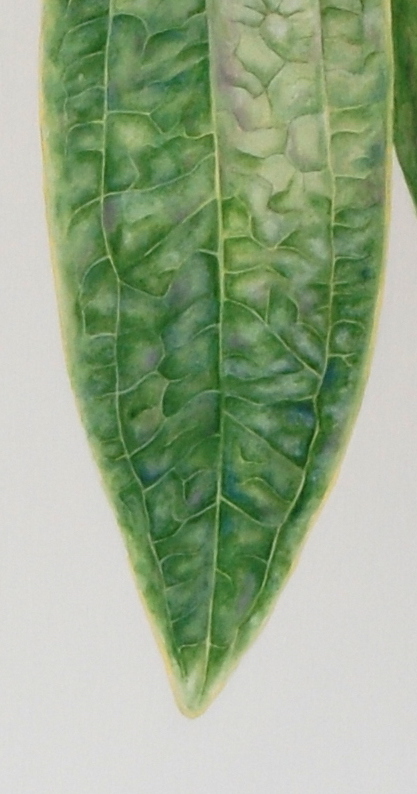 I know you all know that, but to look at the beauty and mystery of this really simple, very common leaf has been a joy. It is alive and thriving out there in my backyard, even though it's been completely ignored by me and the rest of the world. It's just doing it's thing, quietly growing in it's own mysterious way. Enjoy! 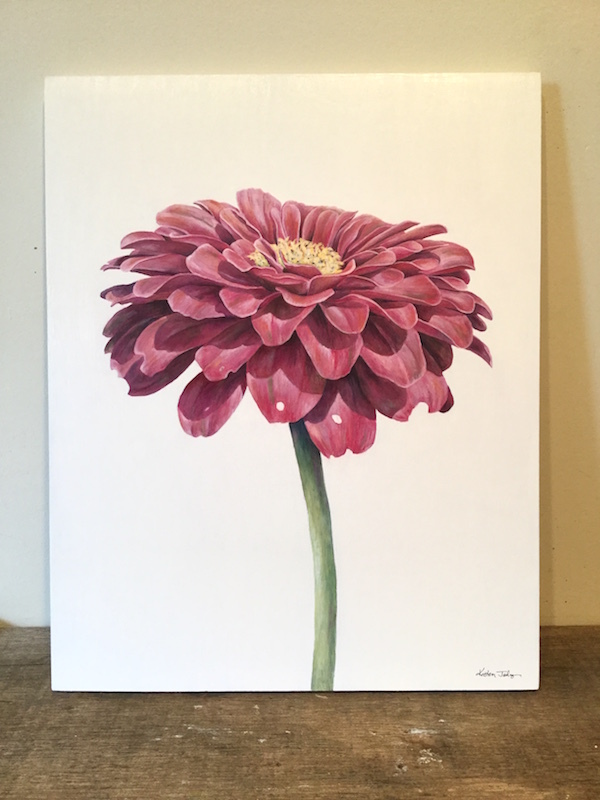 This painting is for sale in my shop! 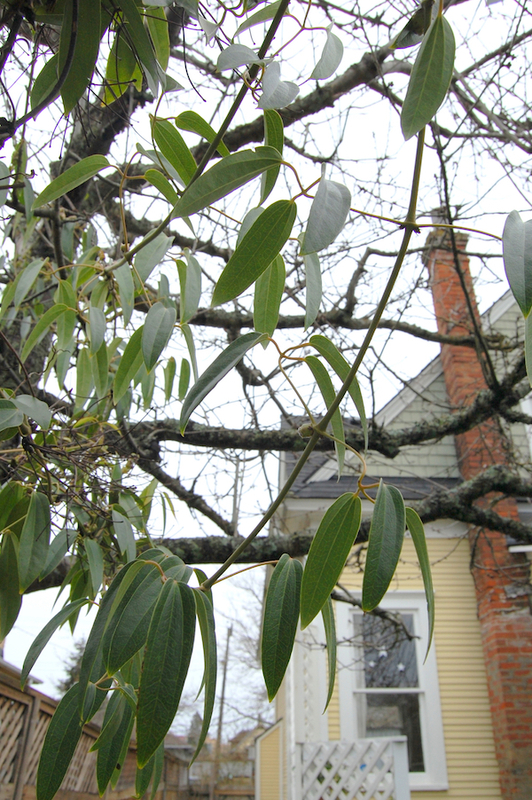 This is my evergreen clematis (clematis armandii) which is very common in my neighbourhood - you can see it everywhere climbing on fences or covering the sides of sheds. Mine is just starting to reach into the cherry tree. But it's because it's so common that makes me find it so amazing. This vine is strong and hardy, yet it has the most elegantly shaped leaves and arching limbs which are starting to reach out and climb further. On such a bleak winter day, it's lovely to find something quietly coming to life again, despite the cold. This will be my next painting... I've already started it. And I'm diving into all sorts of greens and crazy veins and doing my best to make it... well, extraordinary! "It was time to let go"
Here is my latest painting, completely finished (I think... no, I'm certain). It's always hard to declare when a painting is complete. I tend to notice things that are off when I pass by it in the house, or when I see it through my camera lens... "why did I do that stroke? That's got to be fixed". 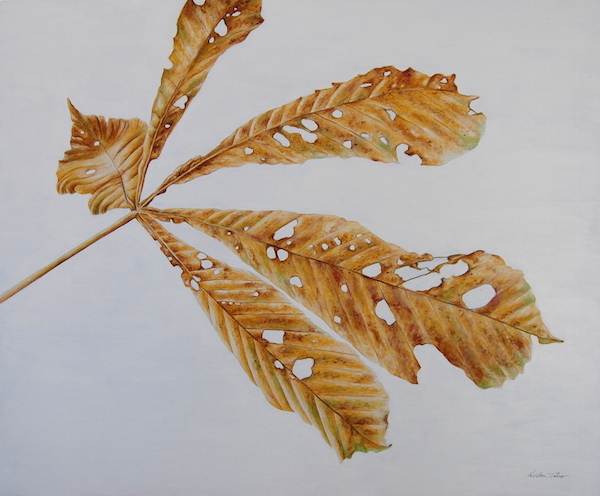 I decided to call this one "It was time to let go", because this beautiful autumn leaf was falling from my chestnut tree last November and looked like it had been through so much over the year. It had been eaten by caterpillars and survived our dry summer and now it was time... time to let go. As I was writing the title on the back of the painting I realized that it was also time for me to let go of this painting! I've really enjoyed doing it, especially all those sunny highlights on the bottom leaf - doing that made my heart beat a little faster. 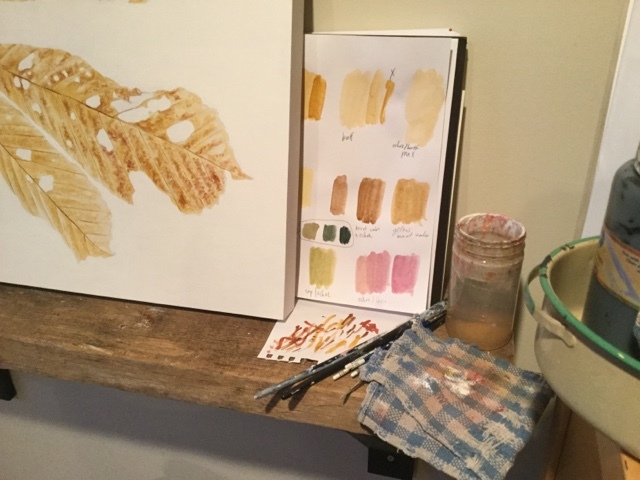 And the lovely golden ochre colours were the perfect hues to play with over the last month. This is a large painting for me, 20 x 24 inches and it's on a thick cradled wood panel. I used my acrylic paints but in a very watercolour style of painting. It is available for sale in my shop. 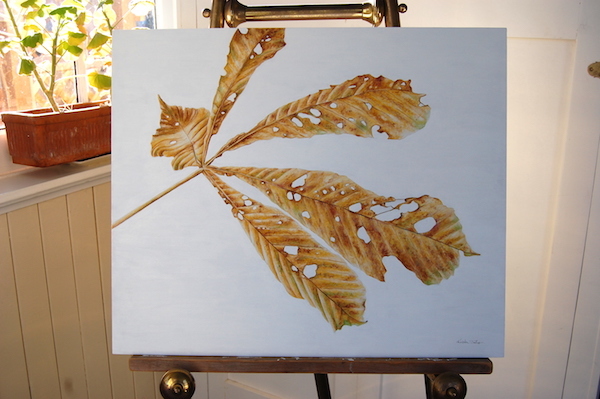 ...painting my beautiful chestnut tree leaf in between all the busyness of Christmas. I haven't posted anything in a long time, but I have been painting! This picture is from a couple of weeks ago when I was still building up the layers of ochre, yellow and burnt umber. 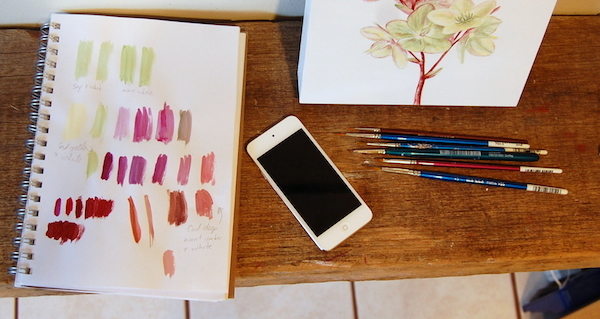 Painting is a lovely place for me to escape to when daily life is busy and filled up with going to and fro. 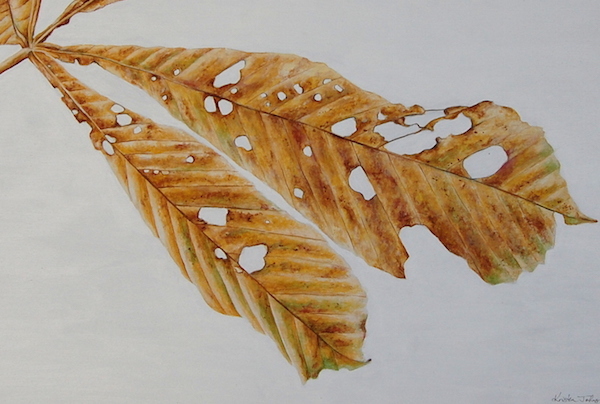 There were several days in December when I had been out at the malls (dare I say, Walmart) and was very happy to come home to paint all of the bumpy edges and smooth sunny highlights of this humble chestnut leaf. Now the painting is (almost) finished - I'll post it very soon!